After the 2011 Fukushima Dai-ichi meltdown there were apparently isolated cases where Shizuoka tea from the Honyama region were found to be contaminated with radiation above the legal limit. I honestly don’t know how many or for how long that continued, but I know the government stepped up their testing of Shizuoka tea 10 fold at the time (40-45% of the country’s tea is grown in Shizuoka and nearly the entire population drinks tea). At their closest point, Shizuoka is over a 100 miles Southwest of Fukushima, on the opposite side of Tokyo and Mt. Fuji. Radiation may have found its way into the ground water 100 miles and several dozen mountain ranges away… But if that’s the case, I’ve managed to personally drink 100s of liters of Shizuoka tea since 2011 with only untraceable amounts of radiation poisoning. Although I doubt I’ve written about it before, Kilogram tea is the distinct branding Intelligentsia Coffee sells its tea under. I encountered it a few years ago when i was training to work as a barista. As with most tea from LA, it tends to be on the more expensive and exclusive side, with prices ranging from $10 to $60 for an ounce or two of loose leaf. Due to its higher price point, and given the fact that it was one of the last stops on my trip, I was only able to bring home three Kilogram teas from LA, but I’m certain they will all be worth what I paid. The first one I wish to review is Shincha Tamagawa. This backwards construction feels extremely wonky, so for the rest of this review I’ll refer to it using correct Japanese grammar as Tamagawa Shincha (Tamagawa being the region where it was grown and Shincha being the type of tea, in this case the very first pluck from March or April of this year). Despite what comes labeled on the package, there is no one “Tamagawa, Japan.” Tamagawa (玉川) is an extremely common name that means “river of droplets” or some such. In Shizuoka there are three city wards bearing that name in Shimizu, Numazu and Mishima. Yabukita, the particular cultivar today’s tea is bred from, makes up 90% of all sencha grown in Shizuoka. Additionally, Yabukita is grown all over Honshu, from as far north as Gifu, so that doesn’t much help us narrow down the growing region. The most likely origin is in Mishima, a more agricultural region. The Tamagawa Ward of Mishima is one of the city’s agricultural, manufacturing and shipping districts and many small shaded farms can be found here. Thus, my best guess is Kilogram purchased this Shincha from a farmer’s market or grower in Mishima. In aroma, Tamagawa Shincha is a thick chlorophyllic Green, as in a field of soybeans after a summer storm. In flavor, a consummate Japanese Green: high astringency, high antioxidants, but somehow still very pleasant with a gyokuro-like grassy aftertaste. 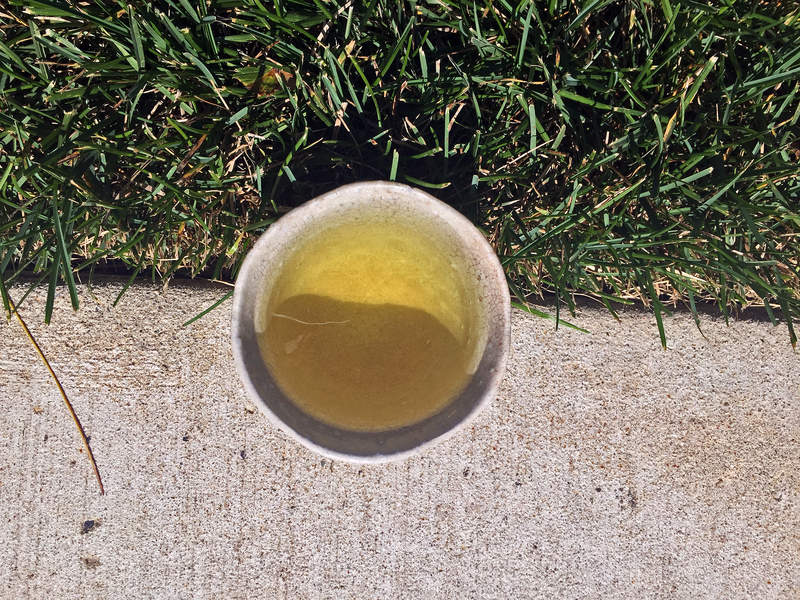 In texture, Tamagawa Shincha is equal parts gooey/buttery infusion and high stemmy grit. The liquor is one of the most yellowed Greens I’ve ever brewed, owing no doubt to the high leaf density and careful manufacture. Although hardly exceptional, Tamagawa Shincha nevertheless exemplary of first pluck umami Yabukita sencha. I could drink it all day, any day (that is, if I could afford to and it was organic). Mean score – A solid 94. For the style and the age, Kilogram’s Shincha Tamagawa is a great deal. Shincha Tamagawa (Kilogram) ~ loose leaf by Jocilyn Mors is licensed under a Creative Commons Attribution-ShareAlike 4.0 International License. Shincha Tamagawa (Kilogram) ~ loose leaf macro by Jocilyn Mors is licensed under a Creative Commons Attribution-ShareAlike 4.0 International License. Shincha Tamagawa (Kilogram) ~ spent A by Jocilyn Mors is licensed under a Creative Commons Attribution-ShareAlike 4.0 International License. Shincha Tamagawa (Kilogram) ~ liquor by Jocilyn Mors is licensed under a Creative Commons Attribution-ShareAlike 4.0 International License. Shincha Tamagawa (Kilogram) ~ spent C by Jocilyn Mors is licensed under a Creative Commons Attribution-ShareAlike 4.0 International License.